The Royal Château de Blois (French: "Château Royal de Blois") is located in the Loir-et-Cher département in the Loire Valley, in France, in the center of the city of Blois. The residence of several French kings, it is also the place where Joan of Arc went in 1429 to be blessed by the Archbishop of Reims before departing with her army to drive the English from Orléans. Built in the middle of the town that it effectively controlled, the château of Blois comprises several buildings constructed from the 13th to the 17th century around the main courtyard. It has 564 rooms and 75 staircases although only 23 were used frequently. There is a fireplace in each room. There are 100 bedrooms. 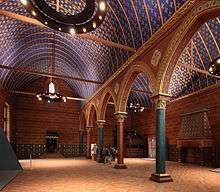 The "Salle des États Généraux", built in the beginning of the 13th century, is one of the oldest seignoral rooms preserved in France, and is also the largest remaining civilian Gothic room. The room was used as a court of justice by the Counts of Blois, and was used in 1576 and 1588 for the "États Généraux". The interior of the Louis XII wing, with the chapel to the right. 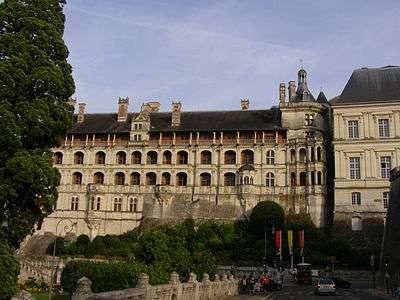 The medieval castle was purchased in 1391 by Louis, duc d'Orléans, brother of Charles VI; after Louis' assassination, his widow, Valentina Visconti, retired to this castle at Blois. It was later inherited by their son, Charles d'Orléans the poet, who was taken prisoner at Agincourt and spent twenty-five years as a hostage in England, before returning to his beloved Blois, which he partly rebuilt as a more commodious dwelling. It became the favourite royal residence and the political capital of the kingdom under Charles' son, King Louis XII. At the beginning of the 16th century, the king initiated a reconstruction of the main block of the entry and the creation of an Italian garden in terraced parterres that occupied the present Place Victor Hugo and the site of the railway station. In 1890 the construction of the Avenue Victor Hugo destroyed the remainder of the gardens. This wing, of red brick and grey stone, forms the main entrance to the château, and features a statue of the mounted king above the entrance. Although the style is principally Gothic, as the profiles of mouldings, the lobed arches and the pinnacles attest, there are elements of Renaissance architecture present, such as a small chandelier. When Francis I took power in 1515, his wife Queen Claude had him refurbish Blois with the intention of moving to it from the Château d'Amboise. Francis initiated the construction of a new wing and created one of the period's most important libraries in the castle. But, after the death of his wife in 1524, he spent very little time at Blois and the massive library was moved to the royal Château de Fontainebleau where it was used to form the royal library that forms the core now of the Bibliothèque Nationale de France. In this wing, the architecture and ornamentation are marked by Italian influence. At the centre is the monumental spiral staircase, covered with fine bas-relief sculptures and looking out onto the château's central court. Behind this wing is the façade of the Loges, characterised by a series of disconnected niches. The "chambre des secrets", mistakenly believed to be Catherine de' Medici's secret hiding place for poisons. King Henry III, driven from Paris during the French Wars of Religion, lived at Blois and held the Estates-General convention there in 1576 and 1588. It was during this convention that the king had his arch-enemy, Henry I, Duke of Guise, assassinated by the king's bodyguard known as "the Forty-five", when the duke came to the Chateau for a meeting with Henry in December 1588. They also killed the Duke's brother Louis II, Cardinal of Guise the following day in the dungeons. After this, the castle was occupied by Henry IV, the first Bourbon monarch. On Henry's death in 1610, it became the place of exile for his widow, Marie de Medici, when she was expelled from the court of her son, Louis XIII. 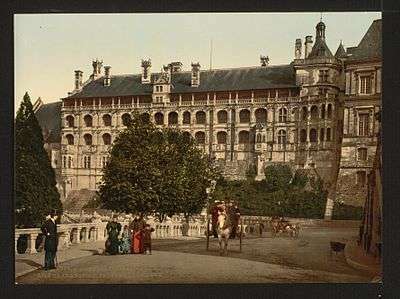 In 1626, King Louis XIII gave the Château of Blois to his brother Gaston duc d'Orléans as a wedding gift. In 1635 there was another attempt to develop the castle but on Gaston's death in 1660, it was abandoned. The task of developing this wing was given to François Mansart, a well-known architect of the time. This wing makes up the rear wall of the court, directly opposite the Louis XII wing. The central section is composed of three horizontal layers where the superposition of Doric, Ionic and Corinthian orders can be seen. By the time of the French Revolution the immense castle had been neglected for more than one hundred and thirty years. The content, many of its statues, royal emblems and coats of arms of the palace was removed. In a state of near total disrepair it was scheduled to be demolished but was given a reprieve as a military barracks. In 1841, under the direction of King Louis-Philippe, the Château de Blois was classified as a historic monument. It was restored under the direction of the architect Felix Duban, to whom is due the painted decoration on walls and beamed ceilings. The château was turned into a museum. On view for visitors are the supposed poison cabinets of Catherine de' Medici. 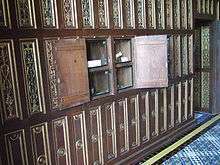 Most likely this room, the "chamber of secrets", had a much more banal purpose: exhibiting precious objects for guests. 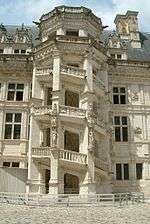 Today, the château is owned by the town of Blois and is a tourist attraction. Wikimedia Commons has media related to Château de Blois.